We regularly review our governance arrangements, to reflect developments in market practice, expectations and regulation as appropriate, and we comply with the third edition of the ASX Corporate Governance Council’s Corporate Governance Principles and Recommendations. This section provides an overview of some of the important aspects of our governance framework. 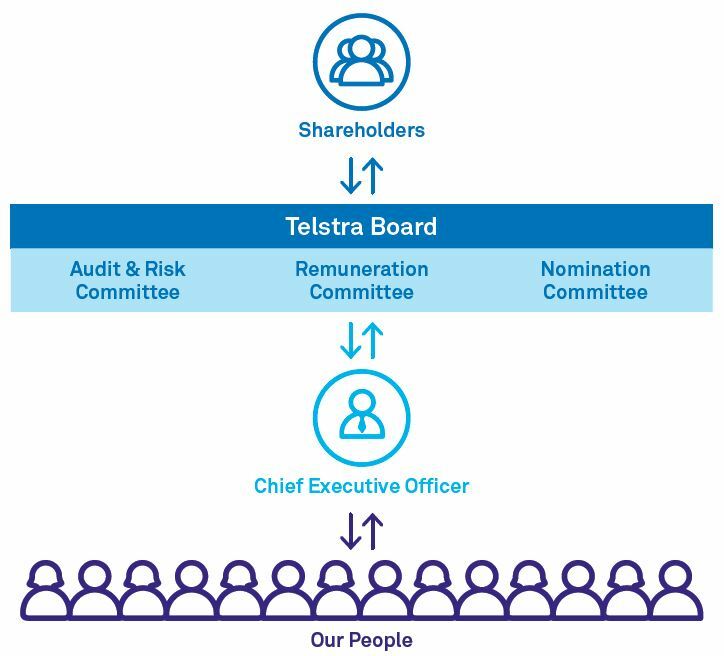 Our full corporate governance statement, which provides detailed information about governance at Telstra, is available on our website at telstra.com/governance. We value and facilitate a direct, two-way dialogue with our shareholders and investors. It is important we provide relevant information as quickly and efficiently as possible to shareholders (recognising the importance of meeting our continuous disclosure and other legal obligations to the market), and listen to and understand their perspectives and respond to their feedback. Retail shareholder information briefings – as we have done in recent years, before our 2015 Annual General Meeting (AGM) we held four retail shareholder information briefings with the CEO, CFO or other senior executives. Briefings were held in Sydney, Brisbane, Adelaide and Perth and attended by about 600 retail shareholders. We intend to hold similar briefings again this year ahead of our 2016 AGM. Encouraging questions in advance of our AGM – we encouraged shareholders to provide us with their questions ahead of our 2015 AGM, consistent with our approach in previous years, and we received more than 800 questions and comments. This helped us understand shareholder issues and concerns and enabled us to address the key areas of shareholder feedback. Electronic communications – we continued to encourage shareholders to provide us with their email addresses so we could communicate with them electronically about events and matters relevant to our company such as our results announcements, dividend payments and AGM. Investor briefings – we held various briefings for investors during the year. In May 2016, we held an Investor Day which included presentations on our strategy, capital management and network resilience. Following the event, we communicated with our electronic shareholders, informing them where they could view the presentations and a recording of the event. The Board actively seeks to ensure it has an appropriate mix of diversity, skills, experience and expertise to enable it to discharge its responsibilities effectively and to be well equipped to help our company navigate the range of opportunities and challenges we face. As at the date of this report, we have 10 Directors on the Board, comprising nine non-executive Directors and the CEO. With the exception of the CEO, all our Directors are non-executive Directors and have been determined by the Board to be independent. Information about our Directors can be found in the Board of directors section of this report. In February 2016, we announced Catherine Livingstone AO would be retiring as Chairman and a Director, having been Chairman since May 2009 and a Director since November 2000, and would be succeeded as Chairman by John Mullen. Ms Livingstone retired from the Board in April 2016, which provided a smooth transition through our Chairman succession. Geoffrey Cousins AM and John Zeglis retired at the conclusion of our AGM in October 2015, each having completed three three-year terms. Trae Vassallo was elected as a non-executive Director at our AGM held in October 2015. Ms Vassallo is an experienced technology executive, investor and advisor based in the USA, with a successful track record in the technology and venture capital sectors. Craig Dunn joined the Board as a non-executive Director in April 2016. Mr Dunn is a highly regarded business leader with more than 20 years of experience in financial services, pan-Asian business activities and strategic advice for government and major companies. Mr Dunn will stand for election at our AGM in October 2016. Russell Higgins AO, Chin Hu Lim and Craig Dunn becoming a member of the Remuneration Committee, Nomination Committee and Audit & Risk Committee respectively. On 11 August 2016, the Board announced the appointment of experienced director and former Accenture regional managing director Jane Hemstritch as a non-executive Director and member of the Remuneration Committee, with effect from 12 August 2016. She will also stand for election at our AGM in October. The Board has identified the mix of skills, experience and expertise it currently has and is looking to achieve in its membership, reflecting areas particularly relevant to the three pillars of our strategy (improve customer advocacy, drive value and growth from the core and build new growth businesses), as well as other areas of general relevance to the composition of the Board. The Board reviews the skills matrix on a regular basis and it helps the Board identify areas of focus and to maintain an appropriate and diverse mix in its membership. Each of the areas of the Board’s skills matrix is currently well represented on the Board. The Board benefits from the combination of Directors’ individual skills, experience and expertise in particular areas, as well as the varying perspectives and insights that arise from the interaction of Directors with diverse backgrounds. In respect of diversity, at Telstra diversity means difference, in all its forms, both visible and not visible, and includes differences that relate to gender, age, cultural background, disability, religion and sexual orientation, as well as differences in background and life experience, and interpersonal and problem solving skills. For FY16, the Board’s objective about Board diversity was that there would be at least three women on the Board, representing a female gender representation among non-executive Directors of at least 30 per cent, with an additional aspiration to achieve 40 per cent female representation among non-executive Directors by 2020. For FY17, the Board has maintained this diversity objective. As at 30 June 2016, there were three female Directors on the Board (including the Chairman of the Audit & Risk Committee), representing a female gender representation among non-executive Directors of 33 per cent. The Board reviews its performance annually, as well as the performance of each Committee and individual Directors. These performance reviews are conducted both internally and, on a periodic basis, externally with the assistance of a facilitator. As the FY15 review was conducted with the assistance of an external facilitator, the FY16 review of Board, Committee and Director performance was conducted internally. The overall conclusion was that the Board continues to operate well in the discharge of its duties and oversight of Telstra. In the context of the significant degree of renewal on the Board in recent times, including the retirement of three long standing Directors during the year, the Board intends to undertake an external Board performance review in the second half of 2016, to assist the Board in actively monitoring its performance and ensuring it continues to operate effectively. The Board has an established Board cycle, which provides a high level overview of items to be considered over a 12 month period. Its key purpose is to link the Board program with strategic and operational priorities and to ensure the Board devotes appropriate time to consideration of the various dimensions of our business across the cycle. The items covered across the cycle include matters ranging from implementation of our strategy, performance against our corporate plan, the status of our material business risks and matters requiring Board approval, to matters relating to our people, culture and governance framework. The Board cycle is reviewed on an ongoing basis to ensure it reflects the current needs of the Board and the business. a Board visit to the US, which provided an opportunity for Directors to engage with other companies to gain insights on topics relevant to Telstra’s strategy, as well as our market challenges and opportunities. Understanding and managing our risks is part of how we work. It helps us meet our strategy and business objectives and our legal and regulatory obligations, and to make informed business decisions and act ethically in the best interests of Telstra Group and our shareholders. Third Line – our Group Internal Audit function, which is responsible for providing independent assurance on governance, risk management and internal control processes. One of the core components of our framework is the risk management process which provides the business with a process for assessing our risks. Through this risk management process, we identify, monitor and report on risks to the achievement of our plans and objectives. The risk management process is inclusive of all types of risks from internal and external sources, including strategic, operational, financial, regulatory, as well as economic, environmental and social sustainability risks. A summary of our material business risks (including any material exposure to economic, environmental and social sustainability risks), their key drivers and our plans to manage them is provided in the Strategy and Performance section of this report. Our material business risks, which are strategic in nature and can have a material impact on the achievement of our strategic growth objectives and future financial prospects, are monitored for changes in their exposure and are reported to the Board during the course of the financial year, along with their related controls and treatment plans. Our key operational risks, which are operational in nature, are monitored and reported to our Management Risk Committee and the Audit & Risk Committee. efficiency. More information about this assessment, along with our approach to sustainability and performance throughout FY16, is available in the 2016 Bigger Picture Sustainability Report at telstra.com/sustainability/report. Also core to our framework are the activities we undertake to monitor and review its design and implementation. We conduct reviews and self-assessments of our framework across the enterprise and report the results to our Management Risk Committee and the Audit & Risk Committee. We use the results of those reviews, as well as recommendations from Group Internal Audit, our third line of defence, to identify and implement opportunities for improving our framework. 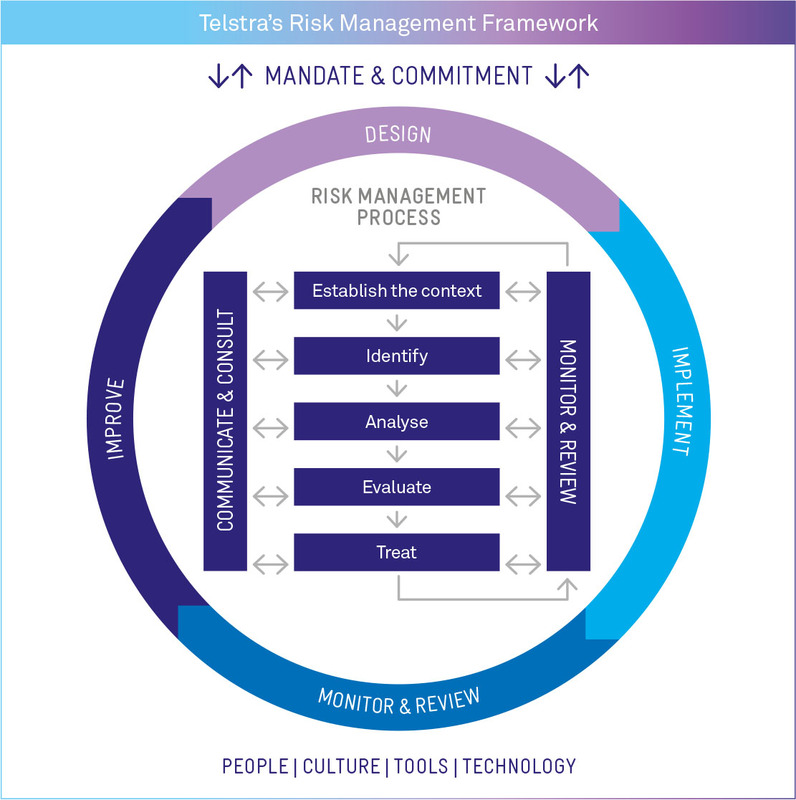 In respect of FY16, the Audit & Risk Committee has reviewed Telstra’s risk management framework and satisfied itself that it continues to be sound. Health and safety – recognising our commitment to the health, safety and wellbeing of our staff, contractors and community. In addition to highlighting the importance of caring about health and safety, it sets out our commitment to providing a safe and healthy workplace and our expectations of our staff, contractors and suppliers. More information about health and safety at Telstra can be found in the Sustainability (Our people) section of this report. Diversity and Inclusion – reflecting the way we value diversity and inclusion at Telstra and their role in enabling us to achieve our strategy, and providing the framework for the Board to establish our measurable objectives. Further information about diversity and inclusion can be found in the Sustainability (Our people) section of this report. Discrimination and Bullying – aiming to ensure we have a workplace free of all forms of unlawful discrimination, harassment, bullying and victimisation. Privacy – setting out our commitment to protect our customers’ personal information. This outlines how and why we collect personal information, how we may use and disclose it, how we keep it secure and accurate, and how customers may access their personal information. Further information on privacy at Telstra can be found in the Sustainability (Customer experience) section of this report and on our website at telstra.com/privacy (which includes our Privacy Statement). Anti-Bribery and Anti-Corruption – aiming to ensure we comply with all applicable anti-bribery and anti-corruption laws. We also seek to ensure that gifts, prizes and hospitality are not given or accepted in inappropriate circumstances, including where the offering or acceptance may (or may be perceived to) compromise independence or be construed as a bribe. Market Disclosure – outlining responsibilities and the process for the approval of our ASX announcements, including where Board approval is required, as well as the role of our CEO, CFO and Continuous Disclosure Committee in relation to disclosure matters. We aim to ensure that we provide our shareholders, investors and the financial community with appropriate and timely information while ensuring we fulfil our statutory reporting obligations under the Corporations Act and the ASX Listing Rules. Social Media – providing guidance to employees and contractors who use social media, either as part of their job or in a personal capacity, about our expectations when they talk online about us, our products and services, our people, our competitors and/or other business related individuals or organisations. Sustainability – seeking to manage our business to produce an overall positive impact for our customers, employees, shareholders, the wider community and other stakeholders, while minimising our environmental impacts. Information about our approach to sustainability can be found in the Sustainability section of this report, our 2016 Bigger Picture Sustainability Report and on our website at telstra.com/sustainability. Whistleblowing – providing an avenue for anyone to report suspected unethical, illegal or improper behaviour. Our whistleblowing process is supported by an independent service provider and all disclosures are treated confidentially and can be made anonymously. Our Group Whistleblowing Committee monitors disclosures, investigations, recommendations and where appropriate the implementation of actions, and our Audit & Risk Committee oversees the whistleblowing process.